This article is about system energy states. For particle energy levels and velocities, see Maxwell-Boltzmann distribution. 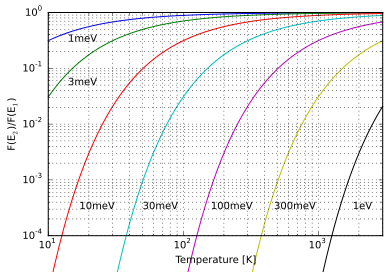 Occupation probability following a Boltzmann distribution depending on the energy difference and temperature. where is state energy (which varies from state to state), and (a constant of the distribution) is the product of Boltzmann's constant and thermodynamic temperature. where pi is the probability of state i, εi the energy of state i, k the Boltzmann constant, T the temperature of the system and M is the number of states accessible to the system. The sum is over all states accessible to the system of interest. The term system here has a very wide meaning; it can range from a single atom to a macroscopic system such as a natural gas storage tank. Because of this Boltzmann distribution can be used to solve a very wide variety of problems. The distribution shows that states with lower energy will always have a higher probability of being occupied than the states with higher energy. The ratio of a Boltzmann distribution computed for two states is known as the Boltzmann factor and characteristically only depends on the states' energy difference. The Boltzmann distribution should not be confused with the Maxwell-Boltzmann distribution. The former gives the probability that a system will be in a certain state as a function of that state's energy. When applied to particles such as atoms or molecules, it gives the distribution of particles over energy states. The Maxwell-Boltzmann distribution is used to describe particle speeds in idealized gases. where pi is the probability of state i, εi the energy of state i, k the Boltzmann constant, T the temperature of the system and M is the number of all states accessible to the system. The sum is over all states accessible to the system of interest. The right hand side denominator of the equation above is also known as the canonical partition function, commonly denoted by Q (or by some authors by Z). The partition function can be calculated if we know the energies of the levels accessible to the system of interest. For atoms the partition function values can be found in the NIST Atomic Spectra Database. where pi is the probability of state i, pj the probability of state j, and εi and εi are the energies of states i and j, respectively. The Boltzmann distribution is often used to describe the distribution of particles, such as atoms or molecules, over energy states accessible to them. If we have a system consisted of many particles, the probability of a particle being in state i is practically the probability that, if we pick a random particle from that system and check what state it is in, we will find it is in state i. This probability is equal to the number of particles in state i divided by the total number of particles in the system, that is the fraction of particles that occupy state i. This equation is of great importance to spectroscopy. In spectroscopy we observe a spectral line if atoms or molecules that we are interested in go from one state to another. In order for this to be possible, there must be some particles in the first state to undergo the transition. We may find that this condition is fulfilled by finding the fraction of particles in the first state. If it is negligible, the transition is very likely not be observed at the temperature for which the calculation was done. In general, a larger fraction of molecules in the first state means a higher number of transitions to the second state. This gives a stronger spectral line. However, there are other factors that influence the intensity of a spectral line, such as whether it is caused by an allowed or a forbidden transition. The canonical ensemble gives the probabilities of the various possible states of an isolated system of fixed composition, in thermal equilibrium with a heat bath. The canonical ensemble is a probability distribution with the Boltzmann form. When the system of interest is a collection of many non-interacting copies of a smaller subsystem, it is sometimes useful to find the statistical frequency of a given subsystem state, among the collection. The canonical ensemble has the property of separability when applied to such a collection: as long as the non-interacting subsystems have fixed composition, then each subsystem's state is independent of the others and is also characterized by a canonical ensemble. As a result, the expected statistical frequency distribution of subsystem states has the Boltzmann form. In particle systems, many particles share the same space and regularly change places with each other; the single-particle state space they occupy is a shared space. Maxwell–Boltzmann statistics give the expected number of particles found in a given single-particle state, in a classical gas of non-interacting particles at equilibrium. This expected number distribution has the Boltzmann form. When a system is in thermodynamic equilibrium with respect to both energy exchange and particle exchange, the requirement of fixed composition is relaxed and a grand canonical ensemble is obtained rather than canonical ensemble. On the other hand, if both composition and energy are fixed, then a microcanonical ensemble applies instead. If the subsystems within a collection do interact with each other, then the expected frequencies of subsystem states no longer follow a Boltzmann distribution, and even may not have an analytical solution. The canonical ensemble can however still be applied to the collective states of the entire system considered as a whole, provided the entire system is isolated and in thermal equilibrium. With quantum gases of non-interacting particles in equilibrium, the number of particles found in a given single-particle state does not follow Maxwell–Boltzmann statistics, and there is no simple closed form expression for quantum gases in the canonical ensemble. In the grand canonical ensemble the state-filling statistics of quantum gases are described by Fermi–Dirac statistics or Bose–Einstein statistics, depending on whether the particles are fermions or bosons respectively. In more general mathematical settings, the Boltzmann distribution is also known as the Gibbs measure. In statistics and machine learning it is called a log-linear model. The Boltzmann distribution can be introduced to allocate permits in emissions trading. The new allocation method using the Boltzmann distribution can describe the most probable, natural, and unbiased distribution of emissions permits among multiple countries. Simple and versatile, this new method holds potential for many economic and environmental applications. ↑ Gibbs, Josiah Willard (1902). Elementary Principles in Statistical Mechanics. New York: Charles Scribner's Sons. ↑ A classic example of this is magnetic ordering. Systems of non-interacting spins show paramagnetic behaviour that can be understood with a single-particle canonical ensemble (resulting in the Brillouin function). Systems of interacting spins can show much more complex behaviour such as ferromagnetism or antiferromagnetism. ↑ The Thorny Problem Of Fair Allocation. Technology Review blog. August 17, 2011. Cites and summarizes Park, Kim and Isard (2012).